While out on the trail for an overnight trip, weekend adventure, section hike, or a thru hike you are going to have bad breath. It is inevitable. 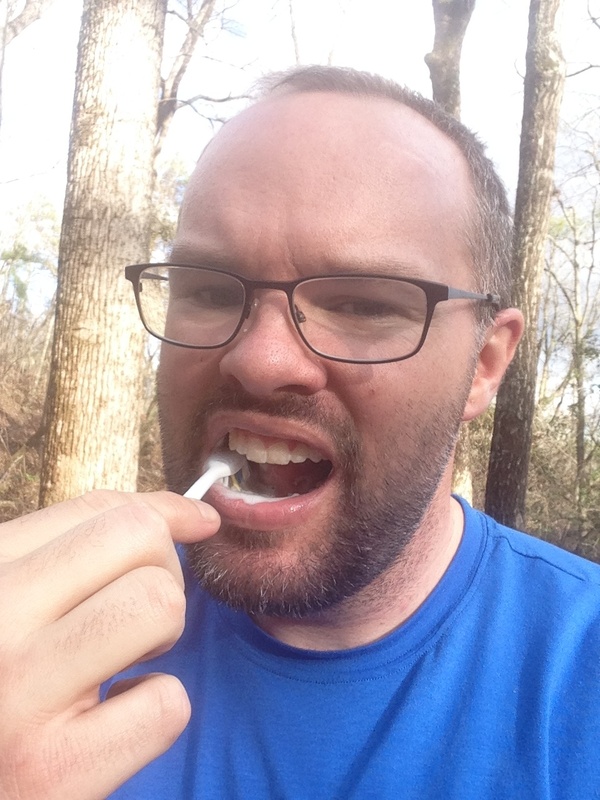 Some will choose to ignore the need to brush their teeth while at on the trail and wait until they get back into town. If this is you, please think of others. If it has been three, four, or (gasp!) five days since you have brushed your teeth your breath is going to be horrible! Do us all a favor and keep reading on a simple and easy way to keep your teeth clean and breath smelling better with a simple and light weight option. Enter Archtek Toothpaste Tablets that I recently reviewed on my last backpacking trip. You will need a toothbrush. I purchased the cheapest toothbrush I could and cut it in half. It worked perfectly and fit nicely into my miscellaneous gear sack. To get started you just pop a single pill into your mouth and chew it up. It immediately starts foaming up in your mouth with a very strong mint flavor. I was surprised at how well the tablets provided a real toothpaste type feel in my mouth. While I was not comfortable asking my friend to smell my breath, I did do a self test and it had a great mint smell. Because these tablets are so small, they are very portable and lightweight. If you are not sold yet, you can get 60 of these tablets (one bottle) for $7.05 on Amazon. So please, do everyone on the trail a favor and get a bottle of these tablets and a toothbrush for your next adventure. Your follow hikers will thank you.